I didn’t know anything about fancy trans-ocean row boats. Apparently a lot of people row across oceans. There is even an Association of Ocean Rowers. The typical ocean row boat has two humps, with sealable hatches, so the whole thing is a floating bubble. They are crammed with navigational gear, as well as the usual marine necessities: cooking, sleeping, working tools. They also are loaded with batteries, solar panels, wind generators, and so on. Used ones go for about $50,000. 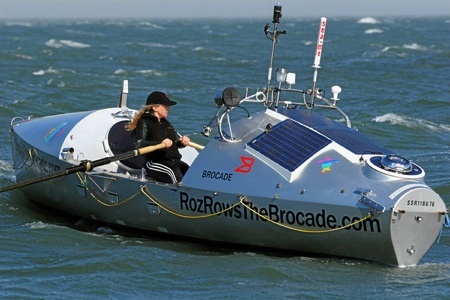 Roz Savage (pictured above) rowed one of these hi-tech row boats across the Atlantic and is now rowing across the Pacific — San Francisco to Australia — solo. Her floating shack is stuffed with expensive gear. “I will be taking about $80,000 of electronic equipment with me on the Brocade, so that I can send back video blogs, podcasts, data, photos and text blogs to my website.” The complete list of her electronic gear is here. With all this sea-hardened equipment she is blogging and podcasting from a row boat in the middle of the Pacific, which is pretty cool.